Bridget Macdonald’s work seems strangely, immediately familiar, even if you haven’t seen it before. This, I realised after spending time in Worcester City Art Gallery, is because she is painting in a clearly-defined tradition of landscape painting (and, perhaps, because some of her Worcestershire and Herefordshire scenes are local). 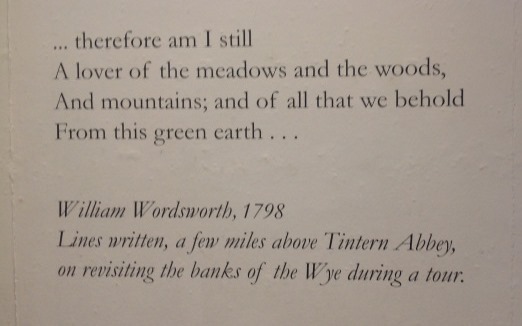 ‘This Green Earth‘, the exhibition’s title taken from Wordsworth’s ‘Tintern Abbey‘,explicitly links Macdonald’s work with Claude Lorrain, Samuel Palmer and Peter Paul Rubens, as creators of a tradition consciously inherited by Macdonald. The effect of this is to indicate not only the significance of this tradition of depicting and celebrating landscape, which is perhaps more vital than ever at a time when we need to be focusing on how to preserve our precious green spaces, but also to demonstrate that landscape painting is not a parochial art: its significance is not limited to its locale. All the paintings in this exhibition tell us eternal truths, about humanity’s relationship to the land, about the changing environment, about the emotional and physical need we have for open spaces, and about the universal appeal of natural beauty. The works on display cover five centuries of painting, but there are clear connections, and Macdonald has clearly drawn intentionally on these. Though she lives in Malvern, and describes this as an ‘Arcadian idyll’, she doesn’t ignore modernity: her work incorporates cars and pylons, and a political dimension too, and her work offers ‘a feeling of landscape’ rather than ‘exact representation’. This isn’t about a photographic approach, then: it’s about exploring emotion and thought as well as painterly skill – as all the best art does. Many of her paintings return to her childhood home on the Isle of Wight, drawing on memory to layer the representation in a different way. Macdonald’s residency at the Barber Institute, University of Birmingham in the 1990s began her interest in exploring landscape art, as she worked directly from landscapes by Claude in particular, transforming them into works with personal meaning for her; some of these are on display here. The choice of quotation for the exhibition’s title can hardly be coincidence; Macdonald is interested in the interplay between literature and art, notably having produced drawings inspired by Sylvia Plath’s beekeeping poems. ‘Tintern Abbey’ intertwines the self with the landscape, suggesting the communion between the two as a panacea for the ills of the world, and as a way of reconnecting oneself to the world and, ultimately, each other. 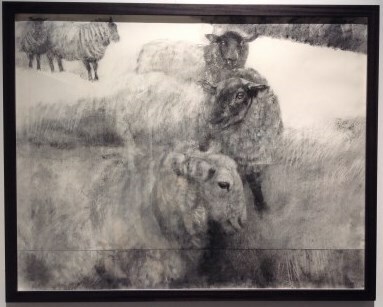 The works are oils and charcoals (some of the largest charcoals I’ve seen), ranging from landscapes in snow (in charcoal) to huge bulls, as well as a wonderful pair of scenes from train windows, complete with raindrops. The beauty and immediacy of all the works here really struck me, and the inclusion of Claude, Palmer and Rubens (chosen by the artist from the Ashmolean and the Manchester Art Gallery) is illuminating. The exhibition is inspiring and refreshing, as landscape painting should be, and it’s free, too – go and see it! Thank you Serena, for this eloquent review of Bridget’s exhibition. As her London gallery, we have been involved with the works selected and the catalogue design, but I have yet to visit the exhibition itself and your account is the perfect encouragement. It will be a pleasure to forward it to her collectors. Thank you very much – I’m delighted you’ve found it of interest. It’s a most enjoyable exhibition – I’m going again soon. I’m giving 2 short talks (both the same) in the gallery on Saturday, April 23rd. Check WCAG website for details if you are interested in coming along. Thank you so much for your comment – I’m very pleased you’re happy with my review. Thank you for pointing out my mistake – now corrected. I’m very interested in art and literature and how they can interact, which is something I think you are also interested in – when I have more time I’m planning to express your work further – I’ve heard about your work inspired by Plath, which sounds fascinating. I’m currently working in a project on art and poetry in Pre-Raphaelitism (https://readingart.wordpress.com). I’ve already got the date for your talk in my diary! I look forward to meeting you on April 23rd. Would be very good to talk about art and literature with you at some point. That would be wonderful. I’ll look forward to meeting you on the 23rd.